Keep Athens Clarke County Beautiful (KACCB) is an organization active in our community working to keep Athens a beatiful place for Athenians to live and for others to visit. I sat down with the Stacee Farrell, Executive Director of Keep Athens-Clarke County Beautiful, to discuss her organization and learn more about how they keep Athens so beautiful. Greyson: What projects does KACCB implement to accomplish its mission? Stacee: KACCB wears many different hats in order to accomplish our mission. First and foremost we have become an important connection to tangible resources in the area of litter education and eradication, garden implementation and sustainability, and community improvement and beautification efforts. Programs like the Athens Area Tool Shed, MLK Day of Service and the Litter Hotline allow us to help others become environmental stewards of the community they live in. We also have a passion for educating our community, but particularly our youth, on the ways to take greater environmental responsibility. We do this through programs like Litter Gitters, Adopt-A- Highway, and Green Schools. The KACCB Board of Directors hosts events like the Dirty Dance Party and the Trash to Treasure Rummage Sale in order to fund specific projects that align with our mission. Greyson: Does KACCB partner with other community groups? If so, for what projects have partnerships formed? Stacee: One of the great strengths of KACCB is that we partner with so many community, government, and non-profit organizations. Some of our partners include The Athens Land Trust, The Community Tree Council, Habitat for Humanity, the ACC Water Conservation Office, Hands On Northeast Georgia, the Upper Oconee Watershed Network, the Clarke County School District, and the Athens Heritage Foundation. In addition, KACCB has been a leader in creating and/or organizing what are now signature collaborative events including MLK Day of Service, Rivers Alive, and the GreenFest Awards Ceremony. These partnerships are invaluable as they make our projects stronger and more sustainable. Greyson: How has the Athens community changed in its reception and implementation of KACCB’s mission? Stacee: As interest in environmental issues has risen over the past decade, so too has interest in our organization. Individuals want to lessen their personal impact on the environment and businesses and corporations what to be more environmentally responsible. The result is that we have seen greater support and participation in all of the KACCB programs. Our public education campaigns have also helped KACCB gain greater local, state, and national recognition. 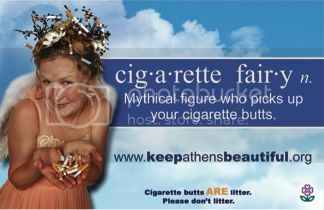 Both the “Seriously” campaign and the “Cigarette Fairy” campaign have won state and national awards, but have also been replicated in several other communities. This effort has brought attention to the problems, attitudes and effects of litter in our communities. Drive around Athens a bit and you are sure to see the “Seriously” bumper stickers on several cars. People embraced our efforts and have helped to further our mission in and out of our community. Greyson: In what ways could the people of Athens become involved with KACCB? Stacee: KACCB has several options for volunteering with our organization. Organized groups might find the Adopt-A-Highway Program appealing as is a great way to help keep our roadways clean. Individuals might find one of our large service days, like MLK Day of Service or Rivers Alive appealing in that you can choose a site based on interest or expertise. We also have on-going opportunities, like our School Gardens Program that require community support with work-days and garden maintenance. Lastly we have “Down and Dirty” projects that can either be catered to a specific group, or that are scheduled based on current events (ie. an illegal dumpsite located, tree plantings, garden needs). Greyson: Where do you see KACCB going from here? What challenges would you like to see KACCB tackle in the future? Stacee: When we present to civic or community groups we often tell people that we could stay and “Talk Trash” for hours if they liked. Although humorous, it is true. We often refer to the ‘Broken Window Theory” to explain to people that litter is more than unsightly. It has its own silent language. It invites crime, lowers property values, deters tourists, pollutes our waterways, affects our wildlife, and ultimately degrades our community. Unfortunately, litter is everywhere. And it is directly related to human behavior. So for the future, KACCB will continue to educate our community. We will continue to work with our law officials to enforce our ordinances, and we will continue to bshinholserister programs that involve citizens to join us in our efforts. KACCB will continue to work on innovative and creative programs until we truly do TACKLE litter. You can find out more about Keep Athens Clarke County Beautiful through their Facebook page. Thanks and have a great week!